Edited excerpts from a book-length analysis of the key actors and character types in Satyajit Ray’s films reveal the darkness lining the noble and the romantic. In one of his interviews, Ray had categorically mentioned that villains, in general, bored him. What he probably meant was the common depiction of an all-evil person in popular culture, including mainstream cinema and the literature, globally. For him, human beings were more ambivalent and less monochromatic. One of the earliest negative roles in a Ray film was Nanda Babu’s in the second part of The Apu Trilogy, Aparajito. The role is played by Charuprakash Ghosh, who was a theatre actor and activist associated with the Gana Natya Sangha. Ray repeated Ghosh in two more films. In Abhijan, Ghosh plays Sukhanram, the uncouth Marwari businessman. Charuprakash’s acting talent was revealed fully in Sukhanram. His dialogue delivery, that was a mixture of broken Bengali and the ubiquitous greed conveyed through his facial expression, was stunning. 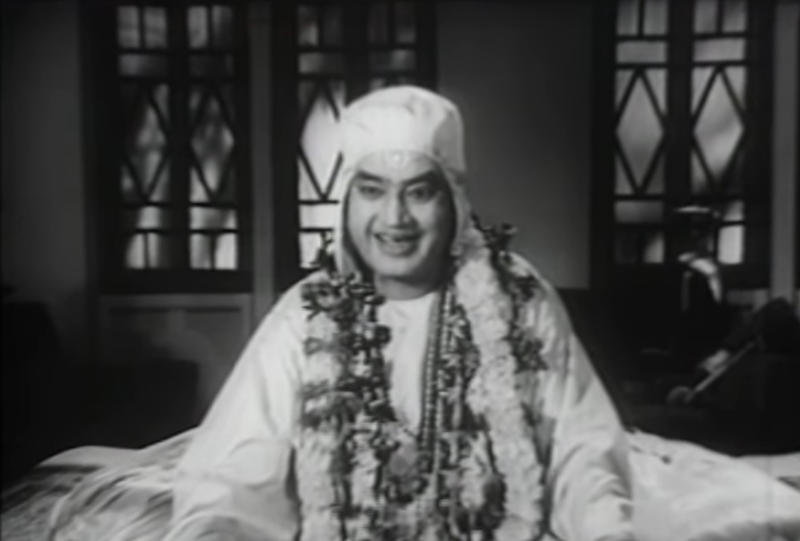 Charuprakash Ghosh in Abhijan (1962). Courtesy Abhijatrik. In Ray’s films, the protagonists primarily reflect what the upper-caste Brahmins look like. From his favourites including Soumitra Chatterjee, Sharmila Tagore, Madhabi Mukherjee to even the heroes of his later films like Pradip Mukherjee, Dhritiman Chatterjee and Dipankar De, all of them bear a fair-skinned, sharp-featured semblance. 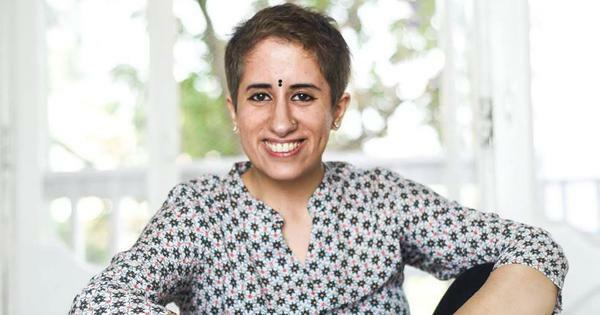 The ones who are not, like Rabi Ghosh or Santosh Dutta or even the legendary Utpal Dutt, are there either for comic relief or to portray grotesque negative characters. Hence, it is no coincidence to find Charuprakash Ghosh being repeated again by Satyajit Ray in Mahapurush, of his couplet Kapurush-o-Mahapurush. Based on noted satirist Rajsekhar Basu’s popular short story Birinchibaba, the film depicts a god-man who claims to be ageless. His long talks touch upon his associations with Plato, Gautama Buddha, teaching Einstein the basics of relativity and what not! 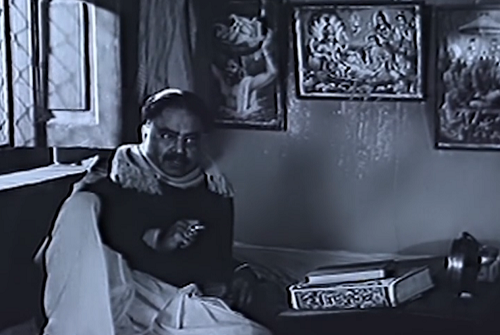 Charuprakash Ghosh in Mahapurush (1965). Courtesy RDB Productions. Portraying a negative character in the guise of comedy was something Ray definitely delved in consciously. Perhaps in this way, he could concentrate on the evil in society that he wanted to decry instead of blaming an individual as a villain. In Goopy Gyne Bagha Byne, Jahar Roy plays the crooked prime minister of Halla, who vitiates the mind of the King of Halla, making him go to war against the kingdom of Shundi ruled by the king’s brother. The minister is depicted as a fat man, full of himself—his greed is almost lascivious. His main aide is a mysterious magician who casts a spell that makes all the people in the kingdom of Shundi dumb. He also poisons the King of Halla with a magic potion, which incapacitates the latter for large periods of time. The remaining time the king is intoxicated to become vigorous and violent, only to lose his virility soon afterwards. Jahar Roy was one of the most celebrated comedians of Bengali cinema. In this role, Ray made him mix his comic mannerisms, keeping his slyness intact. Roy was adept enough to portray the character to the core. In one deft scene, we find him gobbling a big plate full of chicken pieces in front of a low-ranked spy in his army who is ill-fed and starving. The depravity of the character is thus completely established. Goopy Gyne Bagha Byne (1969). Ray’s sublime political slant, which becomes more pronounced and direct with his Calcutta Trilogy, has its seeds in Goopy Gyne Bagha Byne. In one scene, the prime minister threatens to behead Goopy and Bagha if they repeat a song that had melted the king’s heart. This depiction of authoritative governance that throttles the common citizen and robs them of their basic and natural instincts resonates in today’s world. Ray continued the same with more vigour in the sequel, Hirak Rajar Deshe. In the sequel, filmed in 1980, Ray’s stance was firmly rooted to the situation of the country that he had witnessed and assessed for a decade. The Indian Emergency, dismantling the fabric of rational tolerance and free speech for twenty-one months between 1975 and 1977, had its definite representation in Hirak Rajar Deshe. Here, the King himself is genuinely oppressive, as if the prime minister of Halla has been reincarnated with more bile. Ray put his faith in Utpal Dutt for the role of the King of Hirak Rajya (meaning the kingdom of diamonds). Dutt was also a prominent actor in cinema, and received the National Film Award for Best Actor in 1970 for his profoundly somber yet sublimely light representation of a fifty-odd years old dedicated civil servant in Mrinal Sen’s Bhuvan Shome. Utpal Dutt in Hirak Rajar Deshe (1980). Courtesy Government of West Bengal. 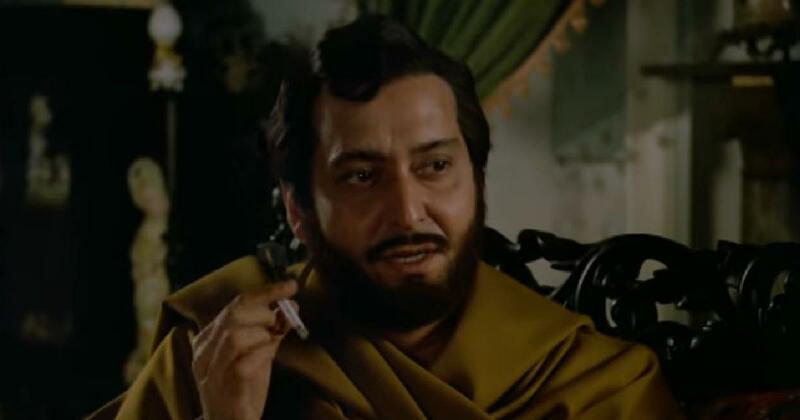 Before Hirak Rajar Deshe and after Jana Aranya, Dutt acted in only one Ray film as the meticulous villain Maganlal Meghraj in Joi Baba Felunath—the last film in the Feluda series. Feluda was Ray’s own literary creation and even fifty years later, (the first Feluda story, Feludar Goenda Giri, was published in Sandesh in 1965), he is still as popular as he used to be. In one of his later stories, Feluda admits that the most heinous villain he has ever encountered in his career is Maganlal Meghraj, whom he came across more than once—the first time being in Joy Baba Felunath. When Ray decided to transform this Feluda story into a film, he chose Utpal Dutt to play the non-Bengali businessman villain. Dutt, who like Charuprakash Ghosh in Abhijan mixes his Hindi with occasional accented Bengali, brings in the right tinge for an immensely successful portrayal. Maganlal is indeed formidable, and halfway into the film, we find him inviting Feluda and his associates to his den and humiliating him wholly. 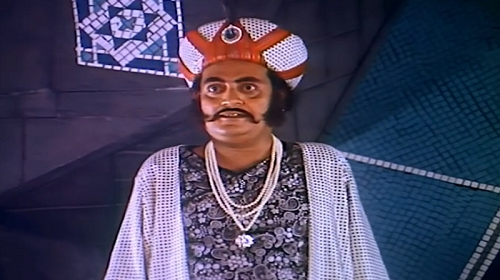 Utpal Dutt gave a staggering performance as Maganlal with his bulbous eyes, which were cold and terrifying. He had by then played the villain in many a film—Bengali and Hindi. Yet, Maganlal is unique in the way he catapulted the ‘villain’ from being physically abrasive to someone more refined, whose intelligence is capable of giving the sleuth a run for his money. Amongst all these films, if Maganlal is an outright ‘villain’, the only other character close to him is Sandip in Ghare Baire, based on Rabindranath Tagore’s novel. The choice of Soumitra was an interesting one. Ray had mentioned to Soumitra his wish to make this film for quite a long time. He initially chose Soumitra as Nikhilesh when the actor was young, but as the possibility of filming Ghare Baire kept being deferred, he made up his mind to cast Soumitra as Sandip. Sandip is the intelligent ‘bad’ man—much different from Maganlal in his shrewdness. He has the façade of an idealist revolutionary who publicly burns down European goods so that ‘Swadeshi’ products can be used, but smokes foreign cigarettes, eyes Bimala—his close friend’s wife—and in the end escapes after putting the Sukhsayar estate ruled by Nikhilesh to communal flames. Soumitra’s Sandip has a subtle nuance, which flits from animal instinct to intelligent and intellectual speeches to formidable singing talent—enough to sweep a woman off her feet. Ghare Baire would remind one of Ray’s earlier Charulata (another Tagore adaptation) where there was a love triangle as well. It was Soumitra who was the home wrecker in both cases, but the purity of the love triangle in Charulata is degraded to a level in Ghare Baire, which is marred by greed and lust. Ray’s romantic vision of life, it seems, is unsettled—if not lost. The noble soul of Amal is lost forever in the decadent one of a ‘villain’—Sandip. 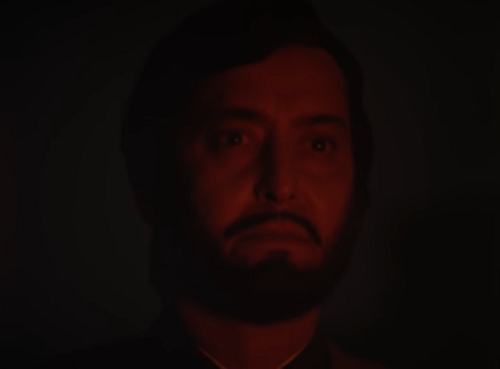 Soumitra Chatterjee in Ghare Baire (1984). Courtesy National Film Development Corporation. Excerpted with permission from Satyajit Ray’s Heroes and Heroines, Amitava Nag, Rupa Publications.